One of the world's most highly-prized minerals, turquoise has been valued for thousands of years, due to its unique opaque color that is unlike any other stone. Our turquoise comes in a variety of colors, ranging from bright sky blue to earthy green. Many of the beads have varying degrees of matrix - the brown or black vein of coloration on the stones. 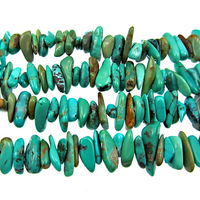 Because turquoise is a porous stone, it is commonly stabilized or treated to seal the surface. This process consequently also protects the color and increases the stone's durability. These beautiful Chinese turquoise chips, nuggets, heishi and classic rounds will add excitement to your jewelry designs. Turquoise can be used as a complementary color or as a contrast color with warm tones like amber or carnelian. Turquoise is one of the December birthstones and is said to promote positive energy, ward off evil, symbolize friendship and stimulate romantic love.